Diabetic Foot Australia operates as an independent organisation, co-located with Wound Innovations. We have engaged with multiple partner organisations across Australia to create a national body for patients suffering diabetic foot disease. A multidisciplinary approach to the Diabetic Foot patient is critical to delivery of a gold standard of treatment. We advocate a coordinated approach by health Professionals, Researchers, Government & Industry as critical to the achievement our vision of ending avoidable amputations in a generation. Diabetic Foot Australia is led by a national multi-disciplinary steering committee, co-chaired by A/Professor Paul Wraight and Mr Peter Lazzarini. The committee is comprised of a broad range of clinical, research and industry diabetic foot disease experts from disciplines such as endocrinology, vascular surgery, podiatry, nursing, epidemiology, clinical research and biochemical research. Members also bring a wealth of experience from representing on international, national and state diabetic foot groups, including the International Working Group on the Diabetic Foot and former national diabetic foot disease group the Australian Diabetic Foot Network. On the 1st July 2018, Diabetic Foot Australia joined the Australian Diabetes Society's (ADS) stable of national diabetes clinical and research programs. Diabetic Foot Australia provides your organisation with unique opportunities to showcase your brand to an audience of future-focused health professionals and researchers with significant influence over the Australian clinical treatment and research sectors. Each year we offer educational events to delegates in the clinical treatment and research domains across endocrinology, vascular surgery, general practice, orthopaedics, podiatry, nursing, pedorthics and other specialties dealing with the diabetic foot. Their decisions are critical to the products and services utilised by diabetic foot patients nationally. After a successful 2017 Diabetic Foot Australia Conference and the premier "What's New in DFU" events in early 2018 featuring Professor Keith Harding, we've launched the DFA 2019 Conference which will be our premier event for 2019. The two-day Diabetic Foot Australia Conference 2017 program boasted national and international key note speakers, plenary sessions and interactive workshops focusing on our key topics: Infection, Vascular, Multi-Disciplinary Teams and Biomechanics. 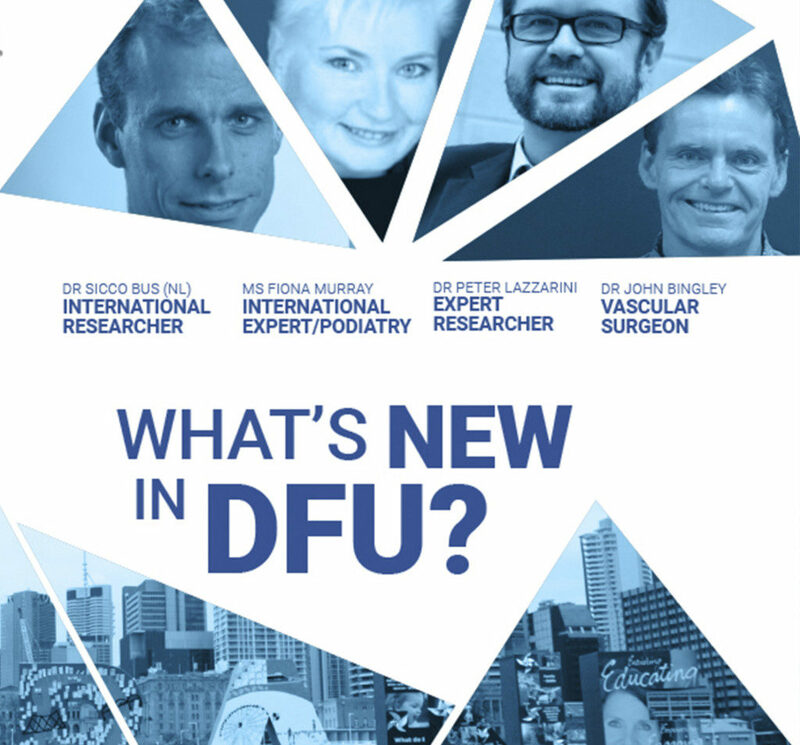 Following the successful 2016 & 2017 "What's New in DFU" event series, Diabetic Foot Australia hosted this premier event series in Brisbane, Melbourne and Sydney to learn about the latest research, evidence-based practice and new technologies. Dr Pete Lazzarini/Dr Byron Perrin launched the "2018 Australian Guideline on Footwear for people with diabetes" just published in the Journal of Foot and Ankle Research. Associate Professor Paul Wraight & Dr Bill McGuiness presented“ Explorer Study Results” URGO's greatly anticipated randomised clinical trial in neuro-ischaemic DFU wounds. 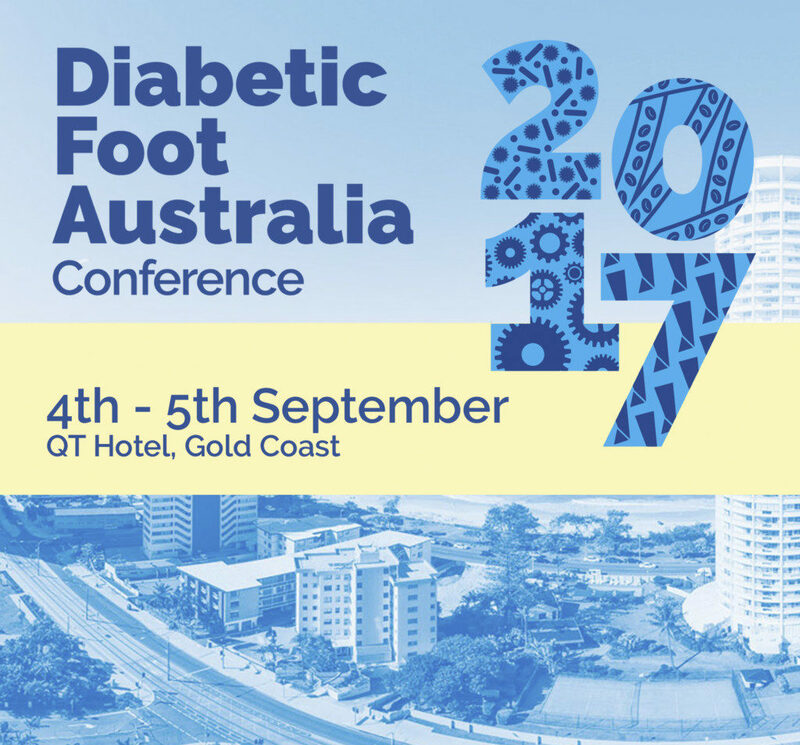 The Diabetic Foot Australia Conference 2017 program boasted national and international key note speakers, Plenary sessions and interactive workshops. Multi-disciplinary topics covered all areas of diabetic foot disease including clinical practice and scientific evidence are included in the program. Over two days at the QT Gold Coast Hotel, our delegates enjoyed the latest in research and practice, and met with industry partners offering the latest products and services. Our social program included an official welcome and registration event, an interactive conference dinner along with fantastic 'Meet the Expert' workshops led by our international speakers. 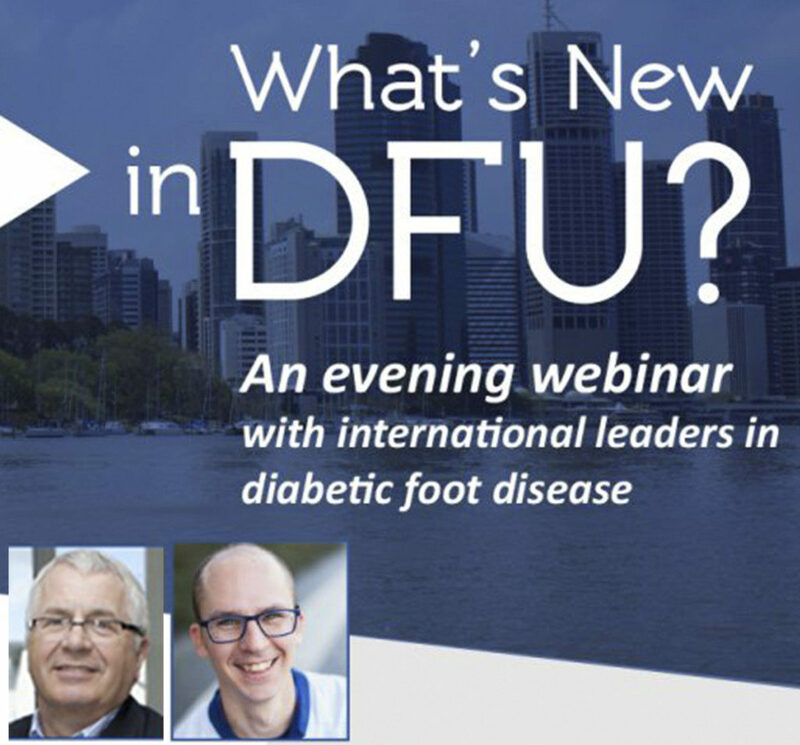 Following the successful 2016 sold out event, Diabetic Foot Australia hosted an exclusive evening to hear ‘What’s new in DFU’ from the world’s best in diabetic foot disease research, clinical treatment and technology. This education event featured renowned international researcher Dr Sicco Bus, alongside national experts’ Dr Pete Lazzarini, Ms Fiona Murray and Dr John Bingley. Dr Sicco Bus presented arguably the best diabetic foot article published in the New England Journal of Medicine entitled “Diabetic Foot Ulcers and Their Recurrence”. An exceptional review of the best strategies to prevent DFU recurrence and extend “DFU remission”. A special webinar, ideal for our rural and remote supporters featured Professor Keith Harding and Dr Jaap van Netten. During this 2 hour event, our guest speakers provided attendees with the opportunity to learn more about the best treatments, technologies and practice – right from the comfort of their own home, with a live feed from DFA HQ and included a valuable 15 minute Q&A session. Featuring internationally renowned diabetic foot expert, Dr David Armstrong (USA), Diabetic Foot Australia hosted this exclusive event to hear ‘What’s new in diabetic foot ulcers (DFU)’ from the world’s best in diabetic foot disease research, clinical treatment and technology. 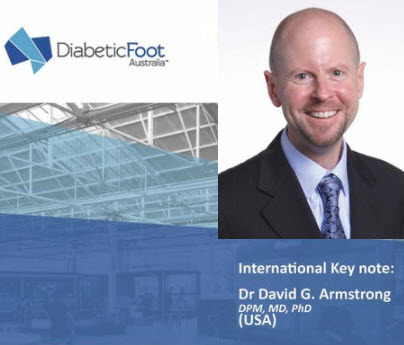 Held at Tonsley, Australia’s first innovation district in a vibrant and dynamic environment in Adelaide, this special event included our keynote speaker Dr David Armstrong (US), internationally acclaimed diabetic foot disease expert from the United States. 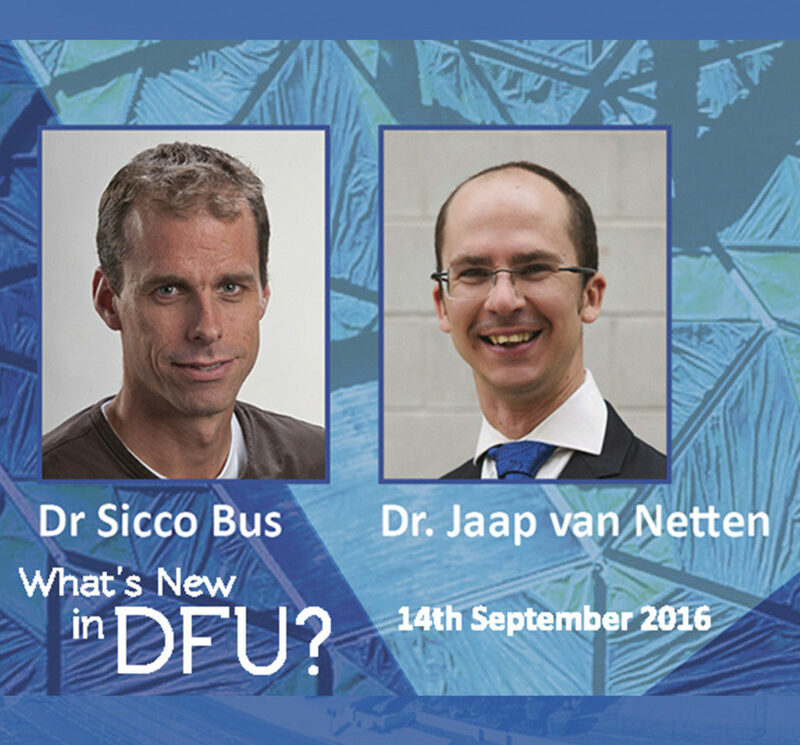 Featuring Dr Sicco Bus, Dr Jaap van Netten and Dr Breda Cullen, Diabetic Foot Australia hosted this exclusive event to hear ‘What’s new in diabetic foot ulcers (DFU)’ from the world’s best in diabetic foot disease research, clinical treatment and technology. Located in the heart of Melbourne’s creative and innovative hub; Story Hall offered the perfect backdrop to update our delegates on the latest cutting edge research, treatments, technologies and practice in diabetic foot disease. Diabetic Foot Australia’s acclaimed inaugural event brought together national and international leaders in diabetic foot disease. 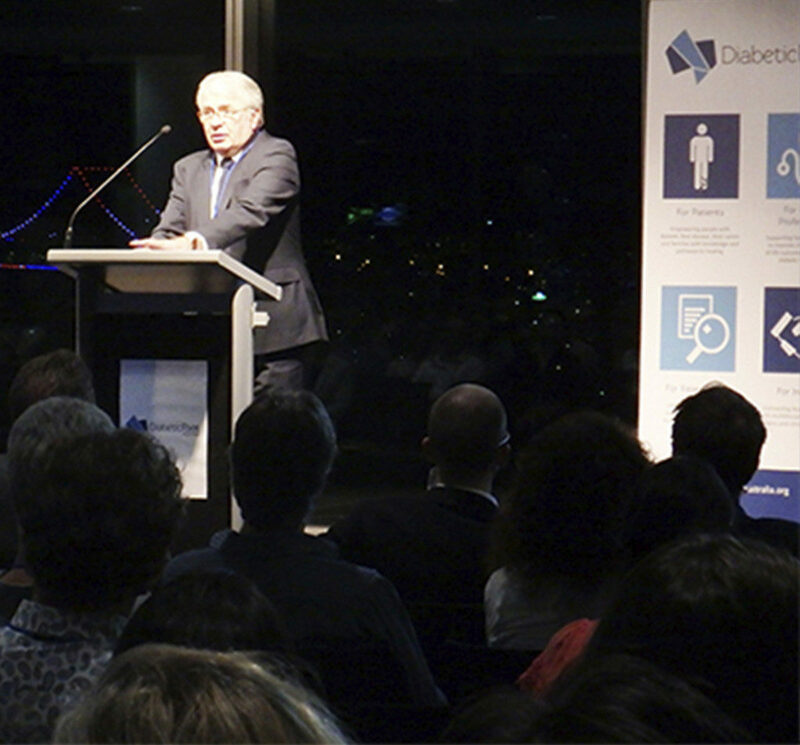 “What’s New in DFU”, was a sell-out event at QUT‘s Room 360 in Brisbane. Delegates included allied health professionals, medical specialists and researchers, all excited to hear the latest from a number of DFA’s vast network of experts. The opportunity to network with international and national speakers was very well received. Our Industry partners, who supported the event, were pleased to engage with new customers and contacts at their trade displays and enjoyed the selection of quality speakers. Stay up-to-date with our upcoming event partnership opportunities by subscribing to our Industry Mailing List. Have an idea or suggestion? Feel free to contact us below.